"Easy and affordable way to make our loved ones happy"
"U guys r doing good job"
"Great Job.....Keep it up.....!!! =M=O"
The second Sunday of May is celebrated as Mother’s Day to pay a tribute to the everlasting power, courage, and strength of a mother. This day celebrates motherhood and maternal love. 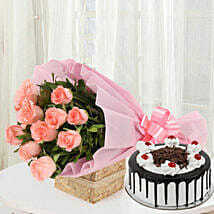 We have come up with beautiful flowers and cake combo gifts which you can send to your mom and make her feel special. 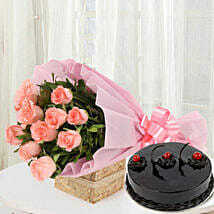 The combination of wonderful Flowers N Cakes for Mother’s Day would be a bright gift idea. 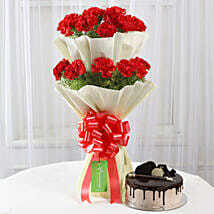 The flowers like roses, carnations, lilies, chrysanthemums, orchids, anthuriums, bird of paradise, etc. 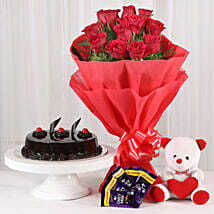 in various vibrant colors are wrapped in majestic bunches, bouquets, and vase/basket arrangements. Have a look at these flowers and imagine how happy your mom would be seeing these blooms right at her doorstep. The world of cakes has exhilarating red velvet cake, butterscotch cake, chocolate truffle cake, mango cheesecake, black currant cake, black forest cake, white forest cake, pineapple cake, etc. So, login to our website and place an order for your mom immediately to celebrate Mother’s Day 2019 with fun and excitement. Mom is the one who taught you how to love. She is the best person in this world because she has a resolution to all your problems. A warm hug or a 5-minute phone conversation with her solves lot many problems. 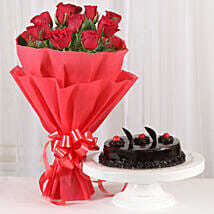 For that special lady, we have thought of some special treatment. 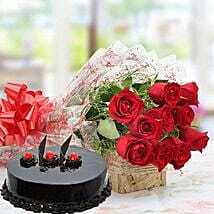 Some of our vivacious gifts are – Enchanted Bloom, Elegant Wishes, Sweet Treat with Flowers, Blesses and Wishes, Rose Repose, Palatable Love, Perfect Combo to Gifts, You Are Always Special, etc. 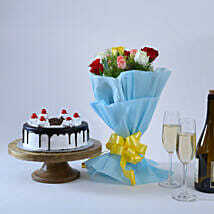 So, send these combo gifts for mom on mother’s day for a perfect portrayal of your love and respect towards her. 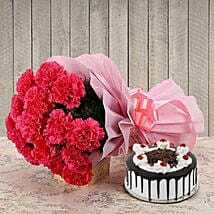 Apart from the combo of flowers and cake, you can also get flowers and chocolates, flowers and dry fruits, flowers and personalized items, and Flowers N Greetings for Mother's day celebration. 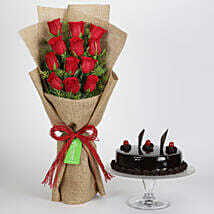 Why Choose Ferns N Petals for Mother’s Day Flowers and Cakes Online Delivery? Timely Delivery: Time is something which is always given the due respect here on our website because we know the value of time. Any gift reaching post the celebration time holds no weight at all. You would never be disappointed with our delivery timeline. 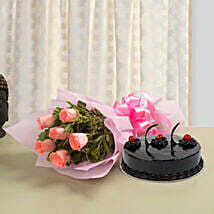 Wide Variety of Flowers and Cakes: Flowers and cakes are the classic gift options which suit every occasion. Roses, carnations, lilies, orchids, bird of paradise, anthuriums, etc. are the variety of flowers. Red velvet, lemon zest, butterscotch, vanilla, chocolate truffle, black forest, pineapple, etc. are some of the variety of cakes. Other Gift Options: Apart from the flowers and cakes, you can also pick up the chocolates, plants, accessories, or cosmetics gifts from our portal. 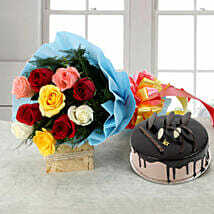 Midnight and Same-Day Delivery: Sending flowers and cakes for your mom right at the midnight or exactly on mother’s day would be very exciting. We assure you great service to surprise your mom on her special day. 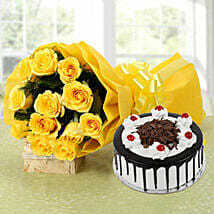 Thus, you can schedule a midnight delivery of birthday gifts for mom using our services. PAN India Delivery: We serve more than 350 locations in India and thus your mom can be seated anywhere from Bengaluru to Bageshwar, Chennai to Cuddalore, Kolkata to Kota, etc. – we will reach her with our spectacular gifts. p>International Delivery: Using our delivery services in the USA, UK, UAE, Singapore, Russia, China, Malaysia, South Africa, Australia, and all other major locations in the world, you can send mother’s day gifts and wish her.